Completely reorganized, this new edition of PATTY'S TOXICOLOGY encompasses eight core volumes and a cumulative index. For the vast majority of chapters (27 through 97, spanning Volumes II through VII) that focus on individual compounds or classes of compounds, a standardized format will be adopted to provide core identifying information for each compound, such as CAS Registry numbers, RTECS number, physical and chemical properties, threshold limit values (TLVs), permissible exposure limits (PELs), maximum workplace concentrations (MAK), and biological tolerance values for occupational exposures (BAT). 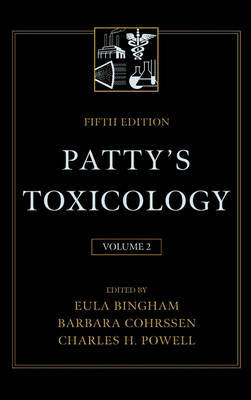 Volume I of PATTY'S TOXICOLOGY features 24 chapters in four sections, providing coverage of topics such as: use of toxicologic data to determine chemical safety; pathways and measuring exposure to toxic substances; reproductive toxicology; carcinogenesis; assessment of toxic risk; cancer risk assessment; toxic substance regulations and guidelines; and toxic chemical information sources. The section on inorganic particulates and dusts contains chapters on silica and silicon, asbestos, talcs, ceramic fibers, fiberglass, coal dust, and combustion products; the section on particulates of biological origin features chapters on biological agents, wood dust, cotton dust, allergens, and nylon flocking; while the section entitled infection agents in the workplace covers bloodborne pathogens, tuberculosis, and other infectious agents.